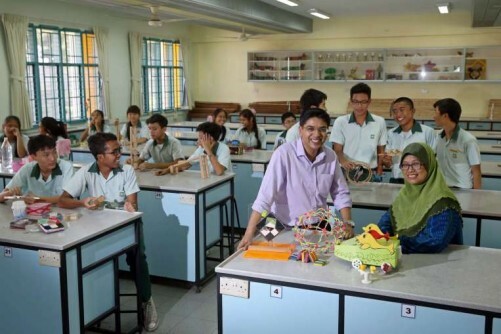 SINGAPORE - Greenview Secondary School school teacher Muhammad Nazir Amir, 38, who teaches science by getting students to design toys, has been shortlisted for a US$1 million (S$1.4 million) teaching prize by a Dubai-based education charity. Dr Nazir, who won the President's Award for Teachers here last year, is among the top 50 finalists shortlisted for the award dubbed the "Nobel Prize for teachers". The Varkey Foundation, which gives out the prize, said that the top 50 educators from 20 countries have been shortlisted from thousands of nominations and applications from 148 countries around the world. The winner will be announced at the Global Education and Skills Forum in Dubai in March 2016. Dr Nazir, who has a PhD in science and design and technology education from the National Institute of Education, inspires his students to think outside the box with innovative methods, such as getting them to conceptualise and create toys. He keeps the toys he makes for lessons and is always eager to share it with fellow educators. The number of shortlisted applicants will be reduced from 50 to 10, and their names will be announced next February. The winner will be chosen by the Global Teacher Prize Academy, made up of prominent individuals including Academy Award-winning actor Kevin Spacey and Ms Wendy Kopp, chief executive officer of Teach For All, a global network of education social enterprises. The Global Teacher Prize is part of the Varkey Foundation's efforts to improve the status of teachers. This year, Ms Nancie Atwell from Maine in the United States won the prize. She was recognised for her work in teaching children to read and write. The public nominated a teacher, or teachers applied for the prize, by filling an application form at globalteacherprize.org.